Gameplay: This is a third person point and click game. The game can be played after installation without CDs in the drive. The main menu is accessed by using the ESC key. The main menu has play, load, save, options, credits and exit selection. The options menu has selections for language (my game has English only); volume for voice, music and sfx, lateral inventory and subtitles. The resolution, antialiasing and graphics quality have several selections also. The save feature is accessed by double left clicking on a blank square until the frame darkens or changes color and then wait until it automatically goes back to the gameplay. The saves can be overwritten. There are scroll arrows on the right side of the squares. There are 30 saved game frames. The inventory screen (stained glass windows) is accessed by moving the cursor to the top of the page. At top right is the diary that has Brother Leonardo's thoughts. Read it frequently for recollection and help on gameplay. Move the cursor to bottom of screen to go back to gameplay screen. Left click of an active item identifies it and right click of the item does the necessary action. Right click skips the dialogue. Double click on an exit arrow hastens the transition to that exit. 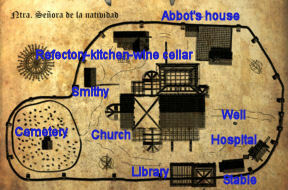 The map of the Abbey is accessed by pressing the M key while outside a building. The 'jump to' feature is obtained by double clicking a location. Brother Leonardo of Toledo, a former royal advisor of the Spanish court is on his way to The Abbey, Nuestra Senora de la Natividad to deliver Bruno, his novice. Bruno is the son of the Count of Capranegra. On the way, a monk tries to kill the travelers by rolling a boulder down the mountain. Leonardo pulls the fallen Bruno out of the boulder's way. Gate: Check the solid gate. Pull the rope attached to the bell. Talk to Egidio, the gatekeeper. He says that no one leaves after Compline prayers. Abbot: Meet the Abbot. He sounds slightly disappointed with the gift of a book. Talk to the Abbot to learn that he wants Leonardo to investigate the death of the former gatekeeper. The Abbot and the gatekeeper are the only ones outside the confines of the cells after Complines. Learn about the rare copies of books that are in the library archives. The librarian and his assistant are the only ones that have access to the library archives. The former gatekeeper, Brother Anselmo was hit by a solid silver censer. Before his death, he has mentioned supernatural incidents at the library. After accepting the investigation, learn that the library is still off limits. Meet Brother Segundo, the prior. Abbot's house: Go back inside the courtyard of the Abbot's house. Segundo's office: Enter Segundo's office and talk to him. He warns Leonardo about completing his investigation promptly. Reception room: Go right at the hallway and check the reception room. See the tapestry, chalice, chests, breastplate, cushion, instrument and books. Kitchen/wine cellar: Go left from the Abbot's house and then right to be at the kitchen/wine cellar or use the map to jump to the place. Wine cellar: Enter the cellar and look around at the wine and beer kegs. Go to the corner and see an alembic. It can be used to distill any kind of liquid. The outlet neck is broken. Exit and go to the kitchen. Kitchen: Talk to Brother Martin, the cook. When talking about the soup - say My sense of smell is not up to snuff today. Brother Eladio supplies the cook with herbs. Take-right click twice the rolling pin above the fire bin. The bellows is broken. Refectory: The refectory door is locked. The Smithy is closed. Check the cemetery's shed and rear area. Go to the passage at left. See a monk carrying some books hide behind a pillar. Librarian's assistant: Right click and talk completely to a very jumpy Godfried of Trentino, the librarian's assistant hiding behind the post. Anselmo was liked by Godfried. Godfried thinks it's a mystery. Go to the desks at left. Go to the index area at left pass Godfried. Index area: See a bas relief on the wall. Right click twice to take blank paper from the table. Brother Umberto's office: Climb up at the archway at left. Talk to Brother Umberto from Lyons, the translator. He doesn't like Anselmo. He thinks it's an accident. Move right to see an overhead view of the room. Try to check the shelves, table and the statue of Our Lady. Umberto would not allow any investigations. Scriptorium: Climb the stairs at left. Talk to Brother Marcello, the librarian. He strictly follows the rules. He needs copyists and only copyists can enter the library. Go to the right side and take the rope from the post right of Bruno's donkey. Talk to Egidio. Nicholas, Godfried and Egidio were holding the 'rotten' rope of the censer. Go to the right and take a closer look at the censer. Click and see the stain at end of the rope. It's not blood, it's red ink. Hospital: Go to the left or use the map. Enter the hospital and talk to an old friend, Eladio from Thebes. Take the pan from the wall right of the entryway. There's a crock and candle on the table. Go to the rear area and see a cabinet. Exit the building. Church: Go left twice. Check the chapel of St. Torcuato, baptismal font, gravestones, the locked crypt door, the pews, the altar and crucifix. Take a candle from the altar or from the candle stand. Cloisters: Go right to the church foyer. Go through the entryway left of the monk cells stairs. Talk to Arcadio the gardener. He is worried about the wilting of Clotilde, the plant. Clotilde, the plant might know something of Anselmo's death. Monk's cells: Go upstairs and check Leonardo's room. Anselmo's cell beside their cell is inaccessible right now. Belfry: Enter the belfry left of the entrance to the church. See a feather in a nest. The ringing of the bell during the Terce prayers might bring it down. Library: Go to the library. Desks: Go left of the passage and talk to Godfried about red ink and about Anselmo. Learn about Anselmo talking about the lights in the library. Scriptorium: Go upstairs twice and talk to the librarian, Marcello. Bruno recalls his copying a sentence over and over as punishment. Leonardo recommends Bruno to be a copyist. To be a copyist, Bruno has to copy the first page of the Hortus tuus in Latin. A copyist brings his own quill. Learn about Anselmo's study in the library, the library archives, rumors and about the former librarian. Godfried: Go down and talk to Godfried. Learn that the Hortus tuus was borrowed by Brother Arcadio. Cloister: Go to the church and then the cloisters. Talk to Arcadio about the Hortus tuus. Clotilde needs bitterwort as a companion. Eladio is making an effusion to relax the Abbot. Learn about Eladio's thoughts on his life, Anselmo, Hortus tuus and the phantom. Ask about bitterwort. Automatically have sealed seed crock in inventory. Eladio wants the crock back. The crock's seal is tight and can't be opened. Well: Go left of the hospital and in front of the gate. Check the well where the Virgin Mary appeared. Click on the rope to get a bucket of water. Bruno wants to bring the bucket up but ends at the bottom of the well. Use the rope on the winch. Bruno comes up dripping wet but forgot the bucket. Leonardo's cell: Meet Bruno now in dry clothes. Go up to the monk's cells and go inside Leonardo's cell. See Bruno's robe dripping on the wall. Use the pan taken from Eladio on the dripping robe to get a pan full of water. Talk to Martin about the soup. Now that Eladio told you about the oregano and thyme, select the dialogue response with those herbs. This impresses Martin. Leonardo was given the privilege to ask for snacks anytime. Learn that Anselmo comes to the kitchen for snacks. Use the pan with water on the stove. Use the sealed seed crock on the boiling water to melt the wax of the crock and get opened seed crock. Cloister: Go to the church and then cloisters. Give the opened seed crock of bitterwort to Arcadio. In return get the Hortus tuus book. Wine cellar: See Egidio asleep at the wine cellar. Get feather for quill: Try to wake Egidio. Hmm. Open the stopper on the wine barrel above him. That woke him up. He runs to ring the bell for Terce. Watch the feather on the nest fall to the ground. Go to the belfry and take the feather. Good for a quill! Cemetery: See Egidio digging at the cemetery. Talk to Egidio until he agrees to open Anselmo's cell. Anselmo's cell: Enter the cell beside Leonardo's. Take Anselmo's book from the table. It's Solomon's Song of Songs. Pick up Anselmo's key from the floor in front of the table. Library: Umberto the translator can help translate the Hortus Tuus to Latin. Go to Umberto at the office on the second level. Ask his advice to help Bruno. Later, he mentions that he's hungry. Kitchen: Talk to Martin the cook. Get soup for Umberto: Use the empty crock on the pot of soup and Martin says to have bread rather than the soup that still needs to be blessed by the Abbot. Talk to Bruno. After a lot of convincing, Bruno talks to and distracts Martin. As soon as able, use the empty crock on the pot of soup to get soup. Library: Go back to Umberto at his office. Talk to Umberto. Leonardo gives the soup. Umberto still will not do the translation. After some more 'convincing', Umberto does the translation. Scriptorium: Go upstairs and talk to the librarian, Marcello. Leonardo in action: After some talking, Bruno is given the test. With more fast talking, Bruno is accepted as a copyist. With even more convincing, Leonardo is allowed to enter the scriptorium with Bruno. Desk: Leonardo and Bruno enter the main Scriptorium. Go to the desk at bottom right. Examine the red stain on the desk. Use Anselmo's key on the lock of the desk. Godfried: Godfried announces the closing of the scriptorium. Godfried is more nervous than usual. Learn that Anselmo was a copyist before he was a gatekeeper. Dinner: Leonardo dined with the Abbot at the main table. It is roast pig for the Abbot's table. Meet Nicholas the blacksmith. Nicholas is impressed with Leonardo's fame. Leonardo's cell: Leonardo has a nightmare of being tortured in the Inquisition. Upon waking, find out that someone took Anselmo's parchment. Library: Go to the scriptorium upstairs. Talk to Thomas, a copyist. Refectory: Enter the left side of the kitchen building and be at the refectory. Talk to Martin mopping the floor. Cemetery: Go to the shed. Shed: Go to the corner, left of the cross gravestone. See blood on the floor. Look close at the blood. Click on the board and find Godfried. Bruno panics and runs away. Hospital: Automatically be at the hospital. Talk to Eladio. Learn about Godfried and later about belladonna as a soporific. Cemetery: Go to the shed and take the shovel right of where Godfried was found. Talk to Bruno about his reaction. Herb book: Go left and talk to Thomas, the new assistant librarian. The herb book studied by Eladio is left on the table. Read the Herbula venenosa and get a recipe for the soporific: snuff, leaf of belladonna, thyme, distill. Umberto: Talk to Umberto at the office at second level. He's as jumpy as Godfried was before. Thyme: Go to the hospital and take thyme from the front table. (Spanish version - check the kitchen for the thyme). Thanks, Paola. Talk to Eladio to find out where to get belladonna. Learn that Clotilde is belladonna. Belladonna: Go to the church and then cloisters. Talk to Arcadio about the tools and Arcadio wants the sickle honed. Take sickle automatically. Take the bellows on top of the keg by the door. Check the keg of gunpowder. Go right and take coal from the barrel left of Nicholas. Talk to Nicholas completely. Learn that he wants to be a goldsmith but stopped by Segundo. Go back to the cloister and use (left click) the sickle on Clotilde to get a leaf of belladonna. Snuff: Go to the Abbot's house. Enter the building. Abbot's house: Go to the reception room at right pass Segundo's office. Enter the Abbot's office and talk to him. Crypt: The abbot brings Leonardo to the crypt. He opens the crypt with his key. Enter the crypt and look around. Oh My! Treasure! Check the bas relief on the left wall. Talk to the abbot completely. Crypt key: The abbot shows the key to Leonardo. Take the crypt key and in inventory, right click it on the candle to get an impression. Exit the crypt and go to the Abbot's house. Abbot's house: Talk to Egidio at the courtyard. Enter the building. Go to the reception room at right pass Segundo's office. Enter the Abbot's office: See that the Abbot's office is closed. Right click-check the window. Leonardo can't reach the window. Talk to Bruno. Leonardo climbs to the window, walks the ledge and enters the Abbot's office. Check the table. Check the drawer below the cups. Check the opened table again to get the reception room key. Check the cabinet at right. There is a chest seen by Leonardo. Right click the word chest and automatically get snuff. Use the reception room key on the door right of the cabinet. Automatically, Leonardo returns the key. Exit the building. Hospital: Go to the front table of the hospital. Use the snuff, thyme and belladonna on the mortar on the front desk. Fair enough. Right click the mortar with the 3 items. Leonardo places the crushed herbs in the crock. Take the pipette attached to the candle setup right of the table. Well: Go to the well. Use the crock with herbs on the bucket of water to get filled crock. Wine cellar: Go to the corner of the wine cellar. Distill the soporific: Use the pipette from the hospital on the broken outlet neck of the alembic. Use the filled crock on the intake neck. Use the coal on the ashes below the alembic. Go to the front part of the wine cellar. Take the torch right of the steps. Use the torch on the coal under the alembic. Automatically return the torch. Use the bellows from the smithy on the coal. Automatically collect the crock with the mixture. Kitchen: Talk to Martin. Learn that there is a backdoor or passage between the library and the church. Use the filled crock on the soup pot again. Then talk to Bruno again to distract Martin. But that's stealing! Martin is wise to Leonardo. As soon as able, use the filled crock on the soup pot to get poisoned soup. Library: Go to Umberto. Talk to Umberto again about everything. Give Umberto the poisoned soup. Umberto drinks the soup immediately. He falls asleep. Check Umberto's book by his head. Go to the right and check the table. Take the statuette of the Virgin Mary on the back wall. In inventory, right click the statuette and get the parchment. Scriptorium: Climb the stairs and check the gate with the ornament on the left and the column at the corner. Stables: Go to the stables. Check Bruno's donkey. The animal is ill. Check the saddlebag left of the donkey. Look inside the saddlebag and get an old compass that Eladio mentioned as a prized possession of Leonardo. Smithy: After getting an impression of the crypt key, go to the smithy. Talk to Nicholas. Use the impression on Nicholas. Nicholas is very busy and won't be able to make it til tomorrow. Leonardo said to give him direction. Give Nicholas the old compass. After talking to Bruno, go back to Nicholas and ask for the key. Get a crypt key. A monk calls to Leonardo that Umberto has been poisoned. Library: Umberto is dead. He was strangled. Leonardo and Bruno stand in the dark church. The church doors are locked. Crypt: Go left twice to the church. Use the duplicate key on the crypt door lock. Bas relief: Left and right click the bas relief. Take the hard won parchment from inventory and click it on the bas relief. Leonardo noted that there are differences between the wall bas relief and the parchment. Right click the parchment in inventory and then click on a motif. Listen to the description. Do the same for the wall bas relief motif and see if there is any difference. 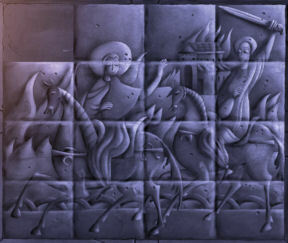 Then click on the wall's bas relief difference. 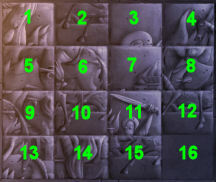 Upper left motif - number of heads of the creature (one has 3 and the other 2). Right click the head of the 2 headed creature on the wall bas relief. Middle motif - the mouth of the devil (one closed and one opened). Right click the mouth of the devil on the wall bas relief. Bottom right motif - the poor souls (one showed moving towards the flame and the other going away from the flames). Right click on the figures on the wall bas relief. See the ossuary with entryways on each wall. Take the thighbone from the pile of bones right of Leonardo. Scratching: Look close (right click) at the scratching left of the entryway at right side of the screen. It is mirror writing. Talk to Bruno and ask for his copyist items. Get additional paper and inkpot. Use the inkpot on the scratching. Use paper on the inked scratching. Use the rolling pin on the paper with scratching. Take the legible scratching. Right click it in inventory. It is from Genesis: Moses 10, first verse. Left room: Go to bottom left room. Go forward to the statue at the back wall. See a crack that should be the left arm of the statue. Use the thighbone on the crack. Pull the thighbone and see that the hand of the clock on the left moves. Move the hand of the clock to point to X (Moses 10). Other room: Go to the room on the top of the screen. Use the hand of the statue to move the hand of the clock to point to I (first verse). Third room: Go to the room with the scratching left of the entryway. See that one stone is different from rest. Use the stone. An entryway to the outside opens. Library: The map doesn't work at night. Go left to front of Abbot's house. Go left to church. Go left to library. See a light on the second floor of the library. Jester - Hahaha. Enter the open door of the library. Go upstairs to the scriptorium. The gate is closed. Look close (left and right click) and study the column at the corner. The motif is chaotic. A picture is needed. Guess who might have a picture of this unique gate lock. Cemetery: Outside the library, go right twice and be at the cemetery. Anselmo's grave: Go to top right part of the cemetery by the tree. Move the cursor to bottom of tree and see Anselmo's grave. Use the shovel on Anselmo's grave. Bruno is ordered to dig. Talk to a frightened Bruno until he digs. Check the open grave. Check the clasped hands. Yuck! After Bruno fills the grave, leave the cemetery and go back to the library. Library: Go left twice and enter the library. Go up to the scriptorium. Column: Look close at column. Click Anselmo's parchment on the column at the corner. Leonardo automatically arranges the column's motif. Library archives: Enter the archives. Take the top right exit. Take the right exit twice. See the archives itself. Click and look close at the books at the bookcase. Find out the secret of the archives. It is filled with heretical books that incite mankind to do abominable things. A monk runs and is chased by Leonardo. See-check a pentagram-Talisman of Saturn drawn in blood on the floor. Study the books on the bookcase and the one book on the bookstand. Someone took pages from the book given by Bruno's father. Marcello's room: Exit and then check Marcello's room. Check the sheet under the stairs. Take the tile under the sheet. Go back out. Library exit: Go down to the library entrance door and find it locked. Go to the left twice and be at the Index room. Bas relief: Use the tile taken from Marcello's room on the bas relief. Tile Slider puzzle: This is just one way of solving this puzzle. Save game for replay. The puzzle can be saved at any point. 2, 1, 5, 6, 7, 8, 4, 3, 7, 8, 4, 3, 7, 6, 2, 3, 7, 6, 2, 1. Leonardo's cell: Leonardo warns Bruno about the forthcoming events and tells him to not say a word. Why not? The hour of truth has come! The Abbot says the funeral mass. Segundo calls Leonardo to the Abbot's office. At the office, the Abbot asks for update of the investigation. Segundo is critical of the situation. Nazario of Milan, one of the Holy Inquisitor arrives and takes Leonardo off the investigation. Kitchen: Go to the kitchen and talk to Martin. Martin is not cooking and will clean the refectory for Egidio. He doesn't want to talk to Leonardo now. Cemetery: Go to the cemetery. See Nicholas, Arcadio and Egidio burying Umberto and Godfried. Talk to all of them. Talk to Nicholas. He is hesitant to talk to Leonardo. Ask about Occultism and Arcadio notes that he knows something is going on. Talk to Arcadio. Arcadio says to wait for him in the garden and he will talk to Leonardo. Hospital: See that the hospital is locked up and Eladio is not around. Cloister: Wait for Arcadio. He does not arrive. Cemetery: Talk to Arcadio again. Leonardo whispers to meet him at his cell. Leonardo's cell: Climb to the Monk's cells. Arcadio: See Arcadio inside the cell. Leonardo goes out of the room with Bruno. Talk to Bruno to stay outside. Go back inside Leonardo's cell. Talk to Arcadio completely. Learn that Arcadio is not senile and that it is an act. He was the former prior and should have been the Abbot but Andres, the abbot betrayed him. Andres was his novice. The Emperor appointed Andres as the abbot because of some hidden reason. Copyists from all over the world arrive in the library. Dark interest evidence was seen in the Abbot's office. Learn that some of the copyists do not know how to read. Arcadio played the senile after being caught in the office. Talk to Bruno and note that he is becoming recalcitrant. Abbot's house: Enter Segundo's office. Take the letter-envelope from Segundo's desk. Read the letter in inventory. Egidio came from San Torcuato and brought here by Segundo. Segundo wants the San Torcuato Abbey to take him back. Talk to Thomas. Learn that Thomas is not allowed upstairs. Talk to Thomas again. Learn about his background. Kitchen: Go to the kitchen. Salad: Look at the heads of salad on the floor. Leonardo sees something after Arcadio mentions rumors about Martin. Take a packet-little bag. Open the bag in inventory to get deck of tarot cards. Martin: Go to the refectory at left. Talk to Martin mopping the floor. Show him the tarot cards. Martin wants the cards back and admits that it is his. It is the only item left from his mother that was burned at stake as a witch. Learn that Berzerk is sent by the devil to take possession of someone on earth to cause havoc. Hear bells. A call to a meeting is sounded. Meeting at Chapter Hall: Segundo calls a meeting. Nazario of Milan calls for Eladio of Thebes. He is not here. Nazario declares that Eladio stole a relic from San Remigio at Tarragona with Umberto the translator as his accomplice. He accuses Eladio of being the killer. Church: Enter the church and take the candle from the altar or if there's one from the candle stand. Kitchen: Use the candle on the pan of boiling water above the fire to get a wick. Talk to Martin. Check the dented scissors hanging on the post. Take the hammer on the floor by the other post. Take the crowbar leaning by the entrance. Use the crowbar on the keg of gunpowder by the entrance. Take gunpowder. Talk to Nicholas at the back area. He returns the compass gift. Hospital: Go to the locked door of the hospital. Place the gunpowder in the door lock of the entrance door of the hospital. Use the wick on the powder on the lock. It is dry and needs alcohol. Wine cellar: Go to Wine cellar. Use the wick first on the stopper. Leonardo says he needs a receptacle. Use the crock on the stopper of the wine barrel. Use the wick on the crock with wine. Go back to the entrance of the hospital. Use the moist wick on the door lock with powder. Go back to the church and take the other candle from the altar. Go to the kitchen and use the candle on the fire to get a lit candle. Use the lit candle on the door lock with fuse. The door lock is blasted. Enter the hospital. Look around and see nothing of importance. Eladio is not here. Ask him to open Umberto's cell. Learn that Nazario of Milan ordered the monks not to help Leonardo. Show the letter taken from Segundo's desk to Egidio. He does not know how to read. Verify that it is a letter held over Egidio's head by Segundo. Learn about Egidio's background. He is Segundo's tattletale. Umberto's cell: Automatically be at the Monks cell at the church. Egidio tears the letter. Look-click Umberto's bed. There's something underneath the bed. See a hole. Look in the hole and see something inside made of metal. Use the crucifix on the hole. It needs something. Use the hammer on the compass. Look at broken compass and get magnet. Use the magnet on crucifix. Use the crucifix with magnet on the hole and get a key. Eladio's cell: Eavesdrop on the cell next to Umberto's. Hear the Abbot, Nazario and Segundo talk about Eladio. Hospital: Go to the hospital. Use Umberto's key on the locked cabinet at back of the hospital. Take the paper-letter and read it. It is the page (invocation spell) from the book given by Bruno's father. Umberto must have been scared when asked to translate the invocation spell page by the killer. He refused to hand it back to the killer. Bruno has now rebelled. No! Bruno stopped being Leonardo's novice. Oh My! Goodbye, Bruno! Smithy: Nicholas is not in the smithy. Take the crumpled note on the floor by the back post. Read the note in inventory. Come to the refectory. Refectory: Go to the Refectory. Nicholas: See a poisoned Nicholas. See the Abbot, Nazario and Segundo find Bruno at the hospital having a moral crisis. Accused: Nazario points at Leonardo as the killer with his accomplices, Eladio and Umberto. The guard takes Leonardo's inventory. Nazario checks all the incriminating evidence in the inventory. This includes the Tarot card as noted by Thomas that is similar to the drawing at the archives. Courtyard: Leonardo is burned at stake. A gloating Nazario of Milan speaking for the Court of Justice states Leonardo's crime. Bruno and the 2 guards are left to watch Leonardo burn. Use the crucifix on the ties that bound Leonardo. Hospital: Find the killer preparing for the invocation of Berzerk. Listen to the explanations about the murders of Godfried and Umberto. Leonardo goads the killer to anger. The killer invokes Berzerk and throws fire. The killer is blocked by Bruno. Burn the book on the table on a fire. Watch the ending explanation of Anselmo's and Nicholas' murder.